Frankie Dettori's Magic Seven is a Playtech video slot based on the day that jockey Frankie Dettori won every race at Ascot. The game has a great horse racing theme with two bonus features and a video poker style gamble option. In the summer of 1996 Frankie Dettori became the first jockey to win all seven races on the card. It happened at the famous Royal Ascot racecourse in the UK and has become one of the worlds most famous days of horse racing. 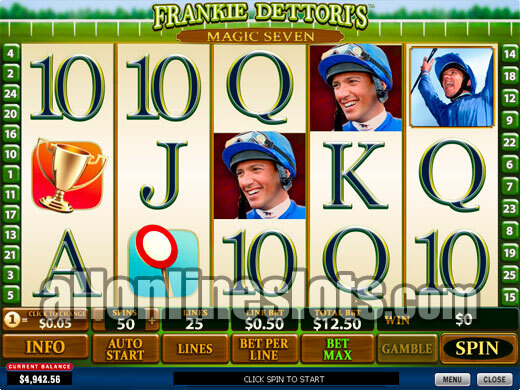 To celebrate the day Playtech have released the Frankie Dettori's Magic Seven slot machine. The game uses the 5 reel, 25 line format and has a 250 coin max bet or 10 coins per pay line. You can choose from a big range of coin denominations that start at 0.01 and go as high as 5.00. This makes for a max bet range of between 2.50 and a big 1,250 per spin. Frankie himself appears on three different symbols with one of him riding, one celebrating and one smiling. The smiling Frankie is the wild symbol which substitutes for all other symbols except the scattered logos and the Bonus Track symbols. Getting five wilds on any active line pays the top line win of 7,777 coins or 77,770 if you are playing max. The game has quite a good range of mid level pays which is great to see. For example the second highest pay is 2,000 coins for five Celebrating Frankie symbols. Then you have a 1,200 coins pay for five riding Frankie symbols, a 1,000 coin pay for four of the wilds and an 800 coin win for five of the trophies. After these pays you have two ways to hit for 250 coins and the the A, K, Q, J, and 10 symbols come in at between 125 and 80 coins for five. Overall there are a total of 37 unique winning combinations. Frankie Dettori's Magic 7 has two bonus features. The first is a pick a box style bonus that is triggered by getting a Bonus Track symbol anywhere on reels 1 and 5 at the same time. You then move to a second screen stage where you select parts of the track to reveal prizes and multipliers (View Bonus Preview). On each pick you can uncover instant cash prizes or a Collect symbol which ends the bonus. You get to keep picking until you either pick all wins or uncover the collect. 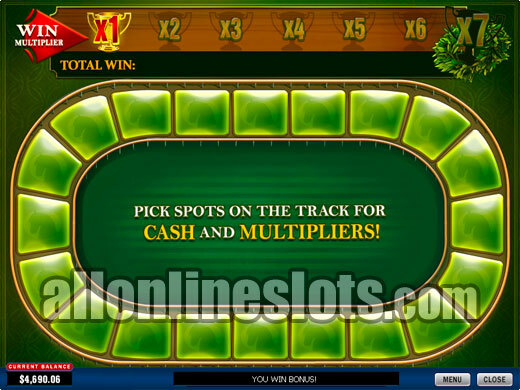 Some picks can award a trophy which starts a video from one of the famous wins and increases the multiplier by X1. You can get a maximum multiplier on the bonus of X7. 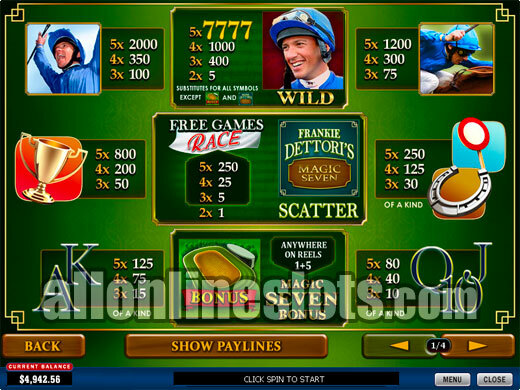 Back on the reels you can win free spins with the scattered Frankie Dettori logos. Get three or more and you move to the Race Bonus. 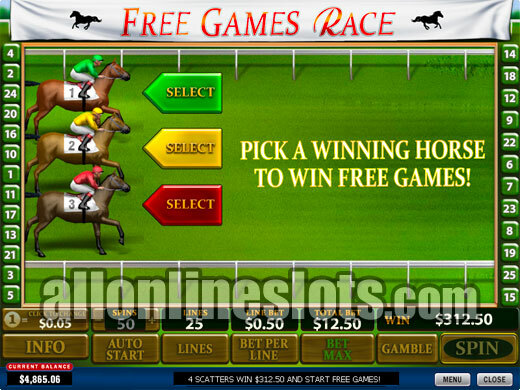 Here you have to pick one horse and then watch the race to see how many free spins you get (Preview). If your horse comes 1st, 2nd or 3rd you win 35, 15 or 10 free spins respectively. There are a couple of negative points that should be noted regarding the free spins. First there is no multiplier so the jackpot on the free spins is the same as the base game. The second negative is that the free spins cannot be re-triggered. While this factors by no means make it a bad game they are worth keeping in mind. On top of everything else, Frankie Dettori's Magic 7 also has a video poker style double up feature where you can try to increase any win. You can choose to risk all or just half of your win which is a great option in our opinion. Overall, Playtech have done a great job capturing the feel of the magnificent day in 1996. 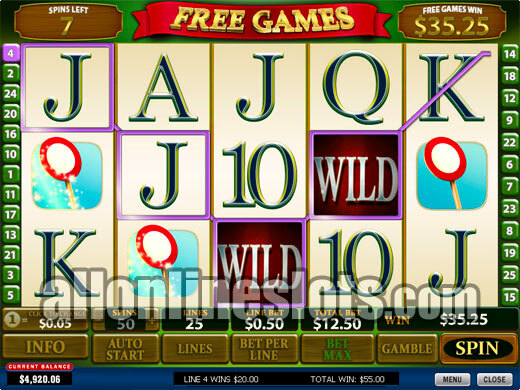 The game offers some good jackpots and quite a few features although we would have liked to seen some sort of multipliers on the free games.